launched their Pickleball Opening Day. The event turned out to be a huge success. We had snacks (including pickles donated by Mt. Olive), free beer, sunshine, and more than 50 people in attendance. We arranged for four members of the USAPA to come to OPRC and educate the staff and members of the club about the fastest growing sport in the country, Pickleball. They gave us a brief explanation about the history of the game, the rules and strategy of the game, and how the game is scored. Then they played out some points so our members could see the game in real time action. After that, it was time for everyone to play! Members were split into groups and sent to a court where they rotated playing games to 11. Each court had an experienced Pickleball player guiding them through the playing and scoring process. It only took a few games before our members began to grasp the game quite well. After that, it was all laughs, high-fives, and trash talk. 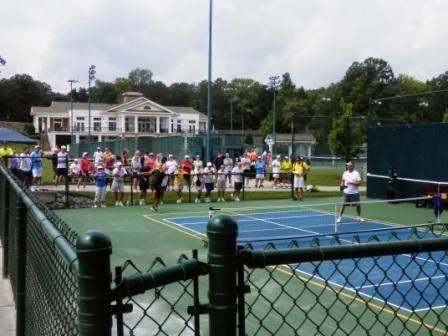 After Saturday’s success, we are confident that Pickleball is going to continue its growth here at Olde Providence Racquet Club.